Dylan continues to appear to have minimal awareness of how hot he is. He rarely sweats and insists that he sleeps with a thick blanket wrapped around him despite the temperature being 29 degrees overnight last night. Dylan is drinking plenty of water but is not requesting any independently and instead relies on us offering him sips literally every 15-20 minutes throughout the day. If he isn’t drinking little and often than he guzzles the water and it ends up making a reappearance leaving him at even greater risk of dehydration. We got up late this morning and all had breakfast together instead of mixing and matching between some of us eating and some swimming as we usually do. After eating its a rule that we make all children stay out of the pool for an hour to let digestion settle but today once the hour was up we were even further into the hottest part of day with the thermostat hitting a whopping 39 degrees celcius. We used the time together teaching Dylan how to play chase the joker. Dylan’s really good at recognising when he has a pair of matching cards and although he required assistance to take his turn and hold his cards correctly (fine motor difficulties again) he really seemed to tolerate the game. Josh and Grace were really kind and let Dylan pick the cards that he needed for the first couple of goes. By the time Dylan got into the swing of it he was winning independently! 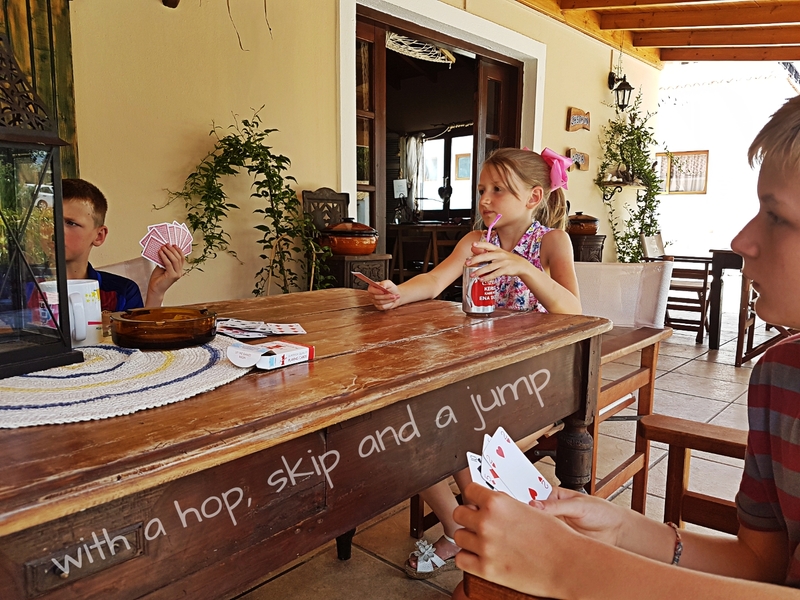 Playing cards is definitely a skill for us to practice and nurture for Dylan to access further age appropriate opportunities and social bonding.